When it comes to pens, I have a thing for the Italians. Japanese and German pens are often wonderful writers, but they tend toward more classic, understated forms. 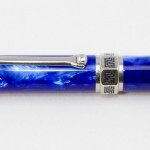 I am drawn to the flair and unique design of Italian pen makers. 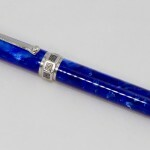 In my top 10 pen (of the moment) are three Visconti pens, a Stipula, and an Omas. 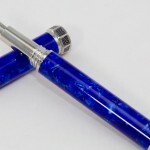 They combine design, stunning and unique materials, and a wonderful writing experience. 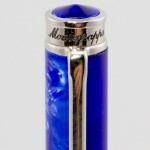 So, when I saw this beautiful Montegrappa in the store display case, I knew I was going to be adopting another Italian. There’s really no doubt; This pen is a stunner. 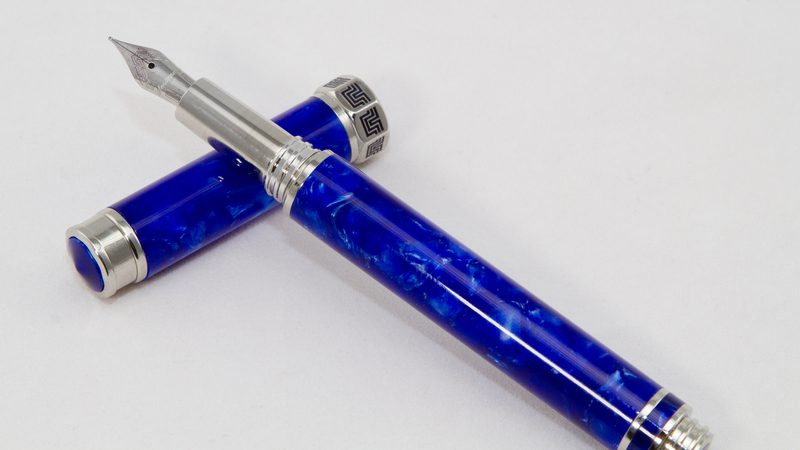 The beautiful blue resin of the pen is full of pearlescent shimmers and swirl, with a lot of depth. The color of the material is intense. It feels almost like someone cranked up the saturation on the pen, but it really is that vibrant and eye-catching. 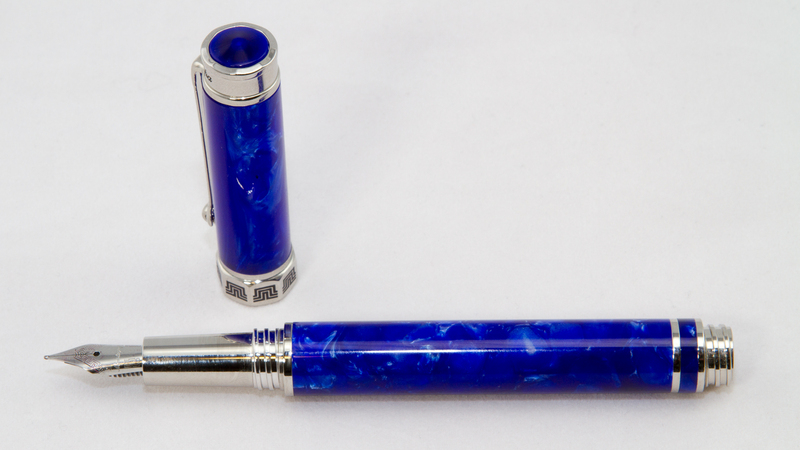 That same blue resin is used to put a small jewel at the top of the cap, and a disc at the bottom of the barrel. 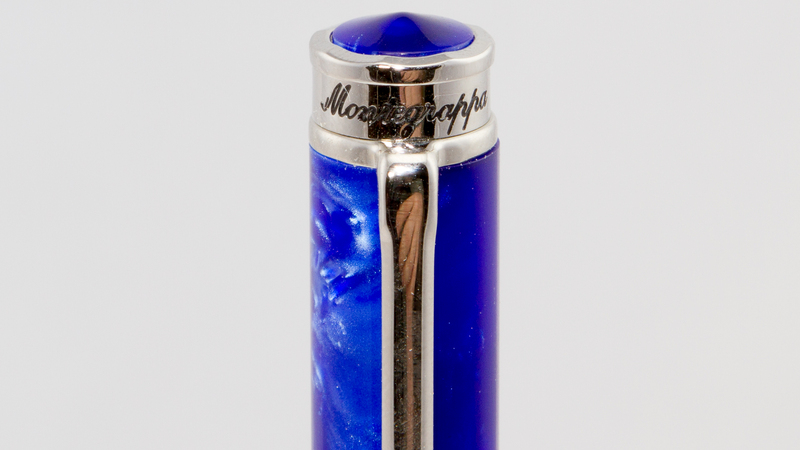 The cap is ringed with steel engraved with the Montegrappa logo. The clip, which is very stiff, has an interesting little roller at the end rather than the more traditional ball. And the base of the cap is ringed by a chunky, octagonal columnar design, engraved with Greek-style decorations. 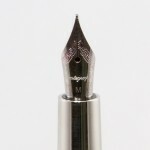 The smaller stainless steel nib is also stamped with that same motif. The section, which is made of chromed steel, is very smooth and attracts fingerprints quite easily. The threads on the barrel are also in steel, providing a rather large step-up between the grip and the barrel. Another nice function is the end of the barrel, which allows the cap to be screwed on to post securely. Even though the posted pen is rather long, I actually found it quite well-balanced when posted. 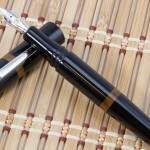 Like many Italian pens, this is not a pen that will blend into the background. 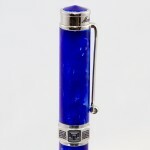 It’s a pen that was made to be noticed, and to draw attention to itself. 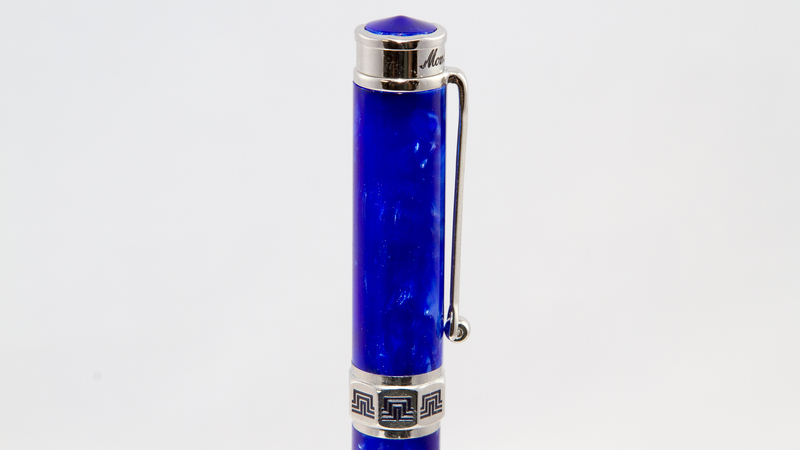 The dazzling, vibrant coloring combined with the shiny chromed metal makes this pen stand out. It was what drew me to the pen in the first place. The steel nib came with a touch more feedback than I generally prefer. It also ran drier than I generally prefer. A few passes with some micromesh and a bit of manipulation of the wings of the nib, and it became a nice writer, albeit still with a touch of feedback. 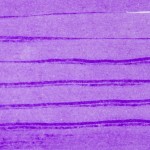 With the nib, however, the cracks started to appear in the facade of the Montegrappa Espressione. 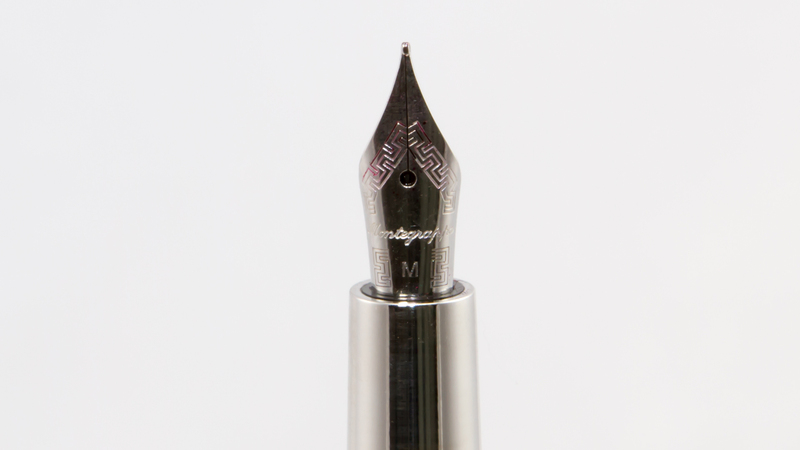 For starters, the nib is stainless steel. 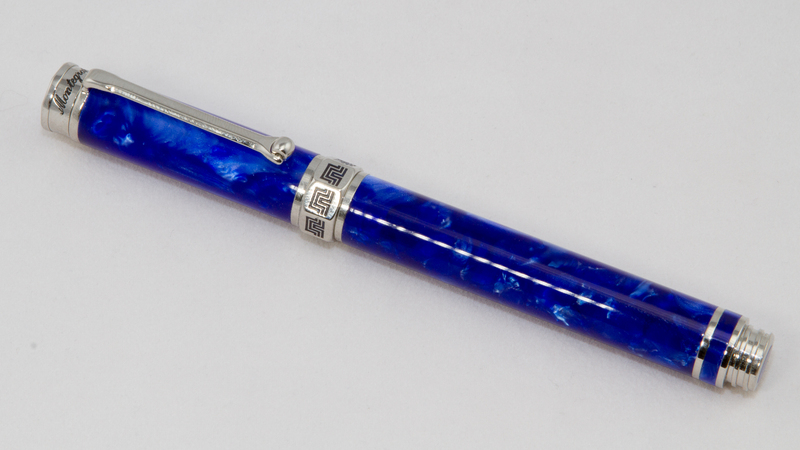 Now, I don’t mind steel nibs as a matter of course, but I find steel nibs on a $300 pen to be a bit ludicrous. When I can buy a gold-nibbed pen at less than half the price, I think it’s time to up the game on the nib. The nib also seemed to run a full size and a half smaller than its stated size. I purchased a Medium (and it’s stamped on the nib as such), but this nib wrote smaller than most of my European fines. In fact, I found it most comparable to a Japanese fine. I don’t mind a fine nib, but I wasn’t expecting this nib to be so much finer than the average European medium. My biggest complaint with the nib on this pen, however, is the size. This appears to be a #5-sized nib which, frankly, is way too small for a pen of this size. It looks out of proportion. And for my hand, anyway, the shorter nib made it almost impossible for me to hold the pen on the section and still have the nib touch the paper at the correct angle. This pen really should have had a #6 gold nib on it, in my opinion. Once the ink flow and smoothness issues were resolved, this pen was a pretty nice writer. I was able to write several consecutive pages without any ink flow issues. It was able to keep up. And the slightly toothy nib wasn’t unpleasant by any stretch of the imagination. Those times where I could grip the pen on the section, I found the metal section itself to be a touch more slippery than I prefer, and not quite as ergonomically pleasing as similar metal sections like those found on my Visconti Dali or Van Gogh. The problem was, I could almost never hold the pen on the section. After using the pen for a couple of days, I quickly realized that this pen would need to go to a new home. The proportions to my hand were just way off. Because the nib was so short, and the section length was all wrong, I often found myself trying to grasp the pen on the barrel or, more often (and much worse), right on the threads. The stepdown between the barrel and the threads is pretty significant. The threads, while not sharp, are very deep, and grasping them for a long period of time made the pen very uncomfortable to hold. The barrel itself was a little too wide to use as a grip at 13mm. 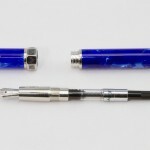 I also found that, because the ergonomics of the pen were off, and the posted weight was toward the high side, I often ended up death-gripping the pen on the threads and stepdown, which was really unpleasant. Overall, I just found the pen extremely uncomfortable in the hand, and after a long writing session, my hand was terribly cramped. Shortly after I recorded the video for this review, the pen was re-homed. 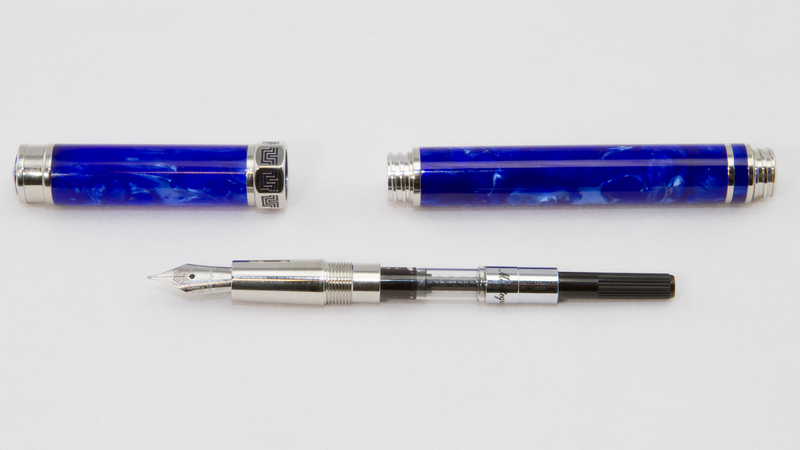 While most of the Italian pens in my collection are a wonderful combination of design, materials, and writing experience, the Montegrappa Espressione seems to have missed the boat on the latter. It has a unique (and I find, very pretty) design, using some of the most beautiful modern materials I have seen. I do find the choice of steel nib on a pen of this price point a bit disappointing, but could have gotten over it had the nib been a bit better. But they seem to have forgotten the idea that form should follow function. 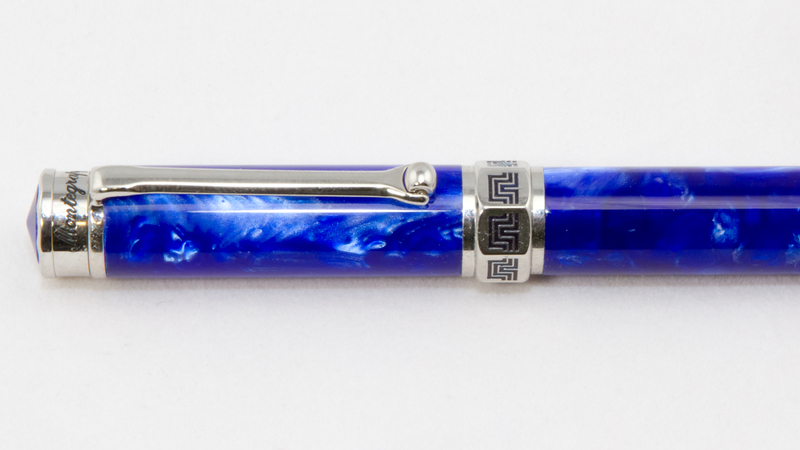 A beautiful pen that is uncomfortable/painful to hold and which has the distinction of actually making my handwriting worse, as if such a thing were possible, is a pen that I’m not interested in keeping in my collection. 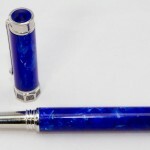 This pen hasn’t made me swear off Montegrappa as a brand, as I found the fit and finish of the pen to be spectacular. It will, however, make me a lot more caution when it comes to purchasing this brand in the future. I’ll need to make sure that the pen actually fits my hand before buying again.